I was browsing the website for the Rijksmuseum van Oudheden in Leiden Netherlands and found information on a type H Viking Sword I have been admiring for some time. I first saw it in pictures posted by Jeroen Zuiderwijk on his website . So many Viking swords with plating on the hilts are so corroded it is difficult to get an idea of what they looked like new. However this sword has almost all of its plating in place and gives us a little window into what these plated swords may have looked like back in the day. This particular sword also has beautiful patternwelded inlays in the blade. Here are some color pictures from Jeroen's Website that show the hilt from more oblique angles. It looks as though there are wooden wedges between the tang and the pommel. 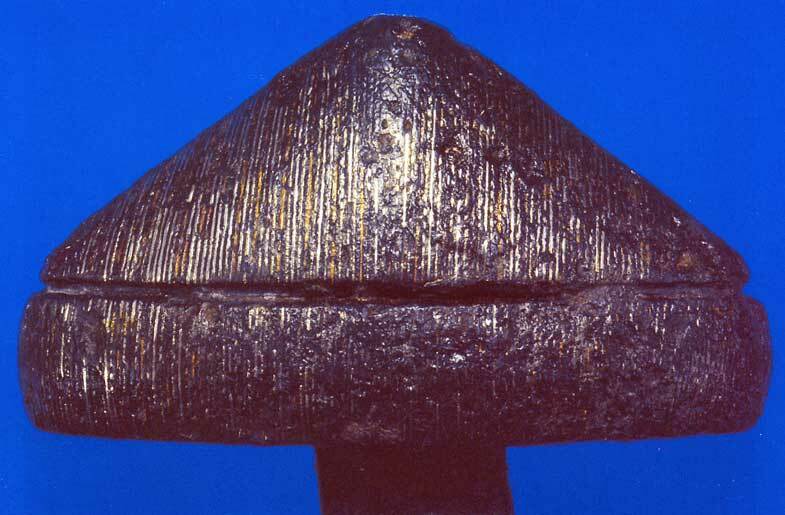 Also note that the groove between the two parts of the pommel is filled with what looks like a carved silver band rather than twisted wire. Photo by Jeroen Zuiderwijk from Rijksmuseum van Oudheden, Leiden. 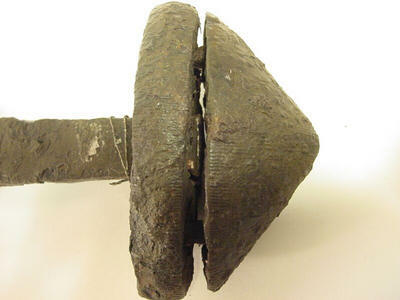 To me that looks like a plate with scalloped edges between the pommel and upper guard. The wood or leather wedges look much newer than the sword itself. I wonder if they could be ad-hoc additions made some time after the sword was discovered? Thanks, Kirk. I was just reading through Oakeshott's Sword in Hand today. 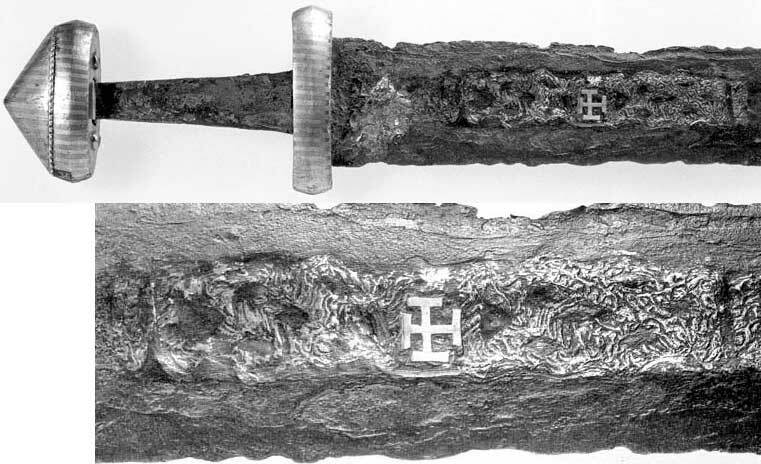 In Chapter 4, he discusses Viking hilt types and gets into hilt ornamentation, saying, "A simple and much-used decoration all through the period consisted of the whole surface being covered with closely placed vertical strips of copper and tin alternately, running from edge to edge of each element." 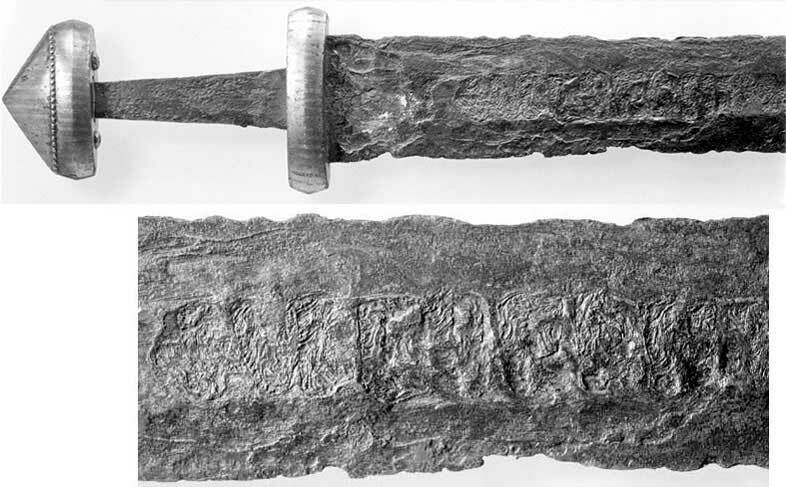 And he provides an example of a Type II hilt, like this one, in his Fig 24. Unfortunately, like all the other photos in that book, it is black and white, so I was wondering what that hilt would look like in color. Now, you've shown me! Patrick pretty much nailed it with the plate between the upper guard and pommel. Doesn't seem to have been all that uncommon to find on some of the two piece examples that have a straight connection. Anyone have any ideas about the hilt materials with this one? Elegant simplicity in both form and decoration . . . . . . I never thought of it being a complete plate rather than a band or strip... makes sense! In another picture from the same museum I saw another set of wedges (shims) sticking up from the top of a pommel... so you are definitely right... the museum probably put the wedges in to hold the components together while they were being moved, or to hold them in the correct orientation while on display. Anyone have any ideas about the hilt materials with this one? Not certain on the material... but it looks like copper or latten (brass) and tin. I doubt the white material is silver because it appears to be duller and more corroded than the gold material. Here is another plated type H pommel from Ian Peirce's "Sword of the Viking Age." In this case. Peirce informs us it is copper wire and silver wire with the iron base material between the wires. 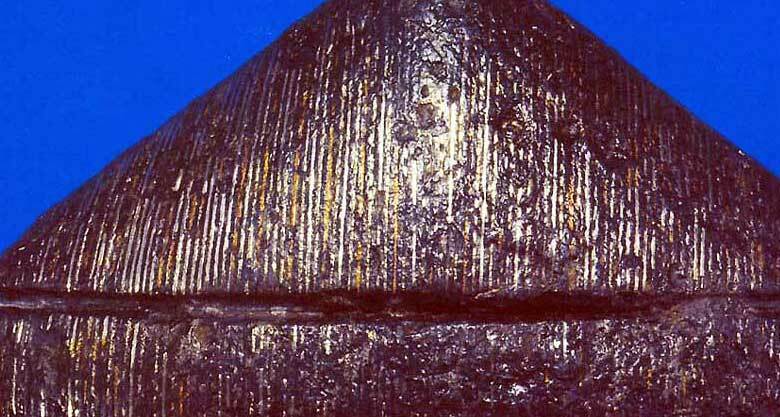 With the whole surface plating seen in the Netherlands find in the previous posts, the surface of the iron was scored and the soft wires were hammered into the scoring to stick to the surface. That is amazing in itself. However in this case it appears that very straight, fine grooves were cut and the tiny wires (some of them twisted) were set into the grooves. It amazes me how such minute and detailed work could be accomplished. I have heard that, back in the day, such a question lead to the legend that there were tiny people (dwarfs) that did such tiny work. In more recent times, some believe that it was done with a large magnifying glass made from clear crystal (although I have never heard that one of these has been found). It is also possible that these sword hilt jewelers were very very near sighted . Whatever the case, it is truly amazing hand work! Detail type H Pommel. Photo by Doug Whitman published in "Swords of the Viking Age"
...Here is another plated type H pommel from Ian Peirce's "Sword of the Viking Age." In this case. Peirce informs us it is copper wire and silver wire with the iron base material between the wires....in this case it appears that very straight, fine grooves were cut and the tiny wires (some of them twisted) were set into the grooves. I'm familiar enough with the typical inlays on these, I've been into the Viking age stuff longer than anything else. This particular example I wasn't exactly sure of though. In a way it doesn't look to me like the gold clad examples we see, but over the years I have only found mention of one bronze/latten based example of the type H. Wasn't sure if this was it or not. Just curious. Why is the blade and grip so decrepit and the guard and pommel so pristine? Gold, silver, copper alloys, and such weather time much better most of the time than iron and steel. With a hilt clad in these types of materials and a good scabbard, it would really make for a well protected sword from use and the elements. Pardon me for jumping in late! The sword at the top of this thread was published in 1986, by (I believe) the conservator – J. Ypey himself. If you can scare up a copy of “Drei neuerworbene Waffen im Rijksmuseum van Oudheden: ein Ulfberht-Schwert, ein Katzbalger und ein Linkhanddolch” from Oudheidkundige Mededelingen uit het Rijksmuseum van Oudheden te Leden 66, 1986 p. 139-151 (also as a reprint from ROB, Overdrukken nr. 290), you can read all about it in German (why German and not Dutch, I dunno). My German ain’t so great, but he does say: “Knauf und Knaufstange sind durch ein Messingperlband von einander getrennt” which I translate as: pommel and pommel bar are separated by a band of beaded brass (Messing = brass, but really ‘copper alloy’ would be more appropriate in this context?). The Vikings/Franks used beaded wire, so that may be what we have here, however he does not mention it being silver gilt which is what it looks like in the photo. From the photo, it does look like a plate with ornamented edge, but I can’t imagine a smith putting that much metal in between there where it won’t be seen, even if it was ‘brass’ not silver. Other interesting things about this sword – 1554 grams, so less rusted away than most, and 99.6 cm long by 6.48 cm broad with the standard 0.5 cm thickness, so this was a biggun for sure. Grip length, ~10 cm. “Der besonders gute Erhaltungszustand des Exemplars resultiert aus seiner Lage unterhalb des Grundwasserspiegels” um, perhaps: well preserved due to it’s lying below the watertable? Found in 1983, not too long ago. Thanks for chiming in with some great information Jeff, and welcome to the forum! Your insights and your translations are very welcome indeed! You've provided some very good information and thoughts concerning the hilt construction, and I'm especially grateful for your providing the weight of the sword as this invaluable information seems all too often to go unreported. The beaded band makes more sense. This "looks" like one of those that has a hollow top portion that would accommodate a "U" shaped rivet with the two end terminating as we see on the outside. The inner hollow could have been filled with "cutler's pitch" or some other organic adhesive to keep it in place. Peter Johnsson has talked about some other interesting ways that they solved the "hollow" top situation. Sometimes the tang ran through the top portion and then it was peened. 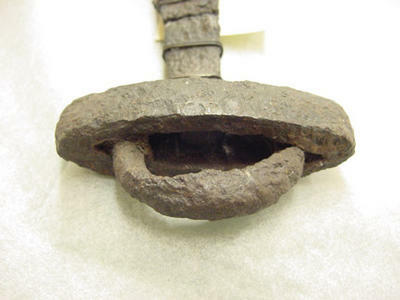 The rivets, then, served to keep the pommel top from twisting. But this one does not appear to have a peened top. This makes the sword even more impressive since many of these type have lost their top because the organic material decayed and then the top fell off and corroded separately from the rest of the sword. This method of construction helped to facilitate the addition of the decorative wire or in this case band. Patrick, I agree about the wood in the pommel. It looks like a conservator may have added these to keep the pommel in place for display purposes. These are often quite loose in the museums. Plus, it is probably how the pommel was secured originally. These are great photos...thanks for sharing Kirk. Here are some pictures that show how these swords were assembled. The first picture shows the "U" rivet without the top pommel in place. This second photo shows the upper pommel piece in place. 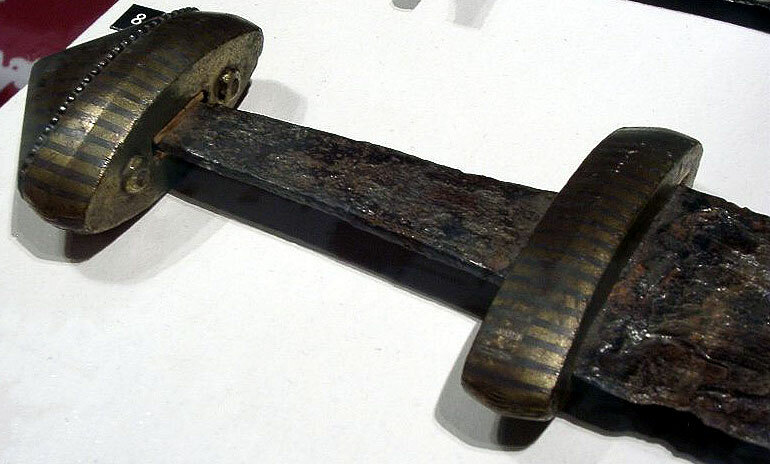 If you click on the picture and enlarge it, you see that the bottom pommel piece is peened (that is the tang peen in the middle) and the upper part is fitted over the "U" rivet. 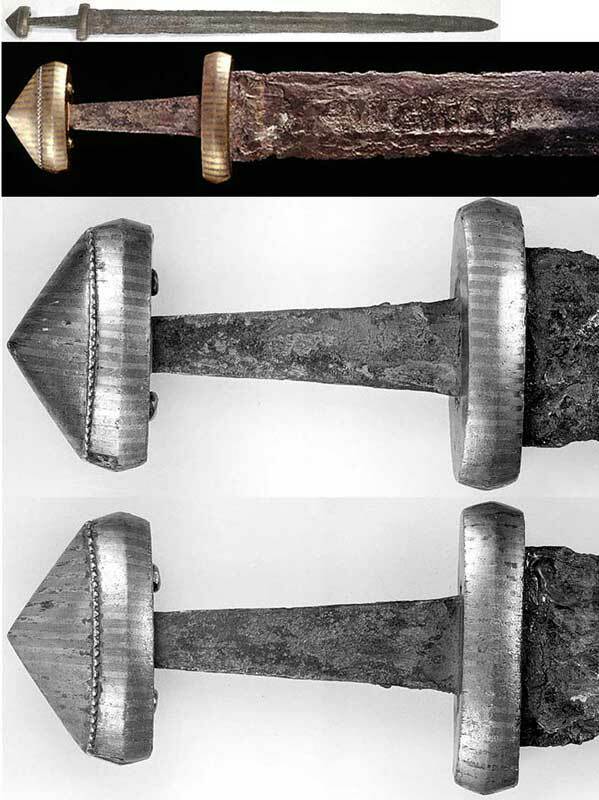 There are a number of swords in collections that just have the "U" rivet and the top was lost, so it is alway nice when you can see it together, and it is always a treat when they are so well perserved like this sword. I've spotted this thread, and since I just live around the corner of the museum (yes, I do consider myself very lucky! ), I took the liberty to pay another visit. I had to study some other objects as well, so that was a good opportunity. Here's a photo of the pommel, as close as I could get. 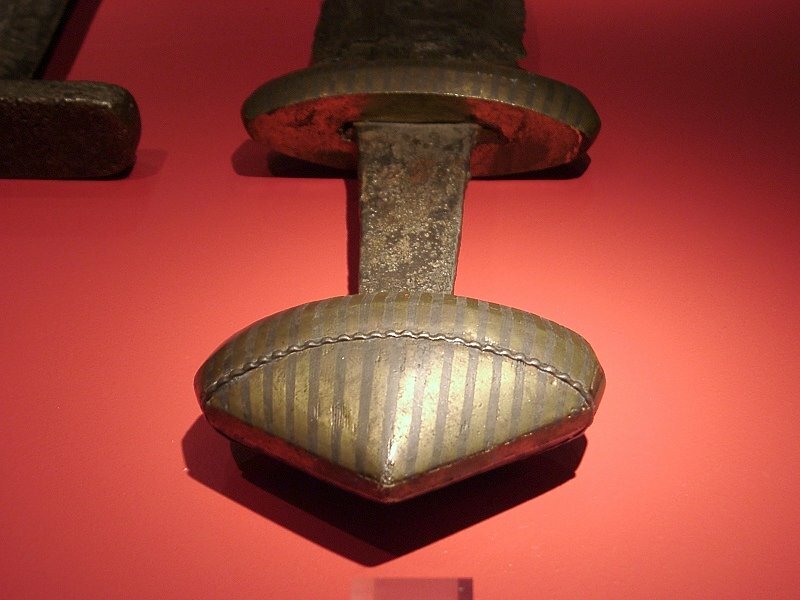 On this one, the stripes also form solid bands, like on the Ulfberth sword in the National Museum of Antiquities. Unfortunately the blade on this one is in a very poor state. There is however some remains of the scabbard. But all I could see was just a rusty lump of sand, which is supposed to contain scabbard remains. They've recently re-arranged the collection in the Army Museum, so I'm planning on going back to do another photo shoot. So hopefully I'll be able to get some clearer photos.